Ever since 8th grade, I knew I was going to study abroad in Ireland. I never had a specific location within Ireland targeted, but when I discovered Champlain College and its campus in Dublin, I knew this was the place for me. I began my traveling abroad however in the 10th grade when I spent 10 days in Spain for a school trip. I instantly fell in love with experiencing another culture and knew I’d be back someday. Last January, I embarked on the journey to Dublin with some great friends and others who became great friends. While there I travelled to Galway and Western Ireland, Belfast and Northern Ireland, Greece, and London. I am a marketing major, and that field definitely needs some sort of abroad experience. When people are selling products and services, they are no longer just selling them to a domestic market, but rather the globe. How can a company expect to sell something abroad with no sense of an alternate, foreign culture? It simply won’t work, and all business majors, in my opinion, need to spend at least a semester abroad to be able to excel upon graduation. The campus in Dublin is absolutely astonishing. We were privileged enough to stay in the Augustine Apartments at StayDublin, a long-term-stay apartment building with great rooms and great service. I had a wonderful time there for 4 months. Our academic building is located on Leeson Street Lower in Dublin 2, the more business district that is right next to St. Stephen’s Green. It was a nice walk every morning from these great residences to this newly renovated 5 story Georgian building where the excellent staff waited. The teachers at the Dublin campus are absolutely fantastic and one of the great pathways into a foreign culture experience. They taught class the way they teach, not like American teachers. We had small classes though, so there were no lectures and everything was hands-on. I was fortunate enough to work on a project with Katherine McGrath and Chris Harris for the Irish Council for Overseas Students, giving me international non-profit experience by the time I was 21. The academics, the obvious social life, and everything else I experienced in my 4 months in Dublin has made me a very strong believer in studying abroad and international education. Whether it’s through your own college or a great 3rd party program, every college student needs to get out and experience the world. 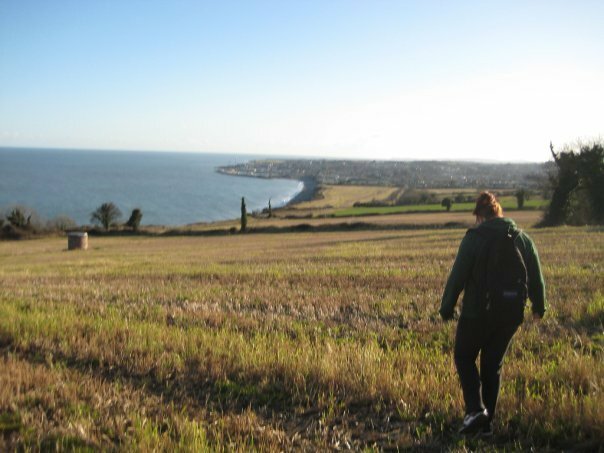 This is a picture of myself walking through farmland on the hike from Bray to Greystone outside of Dublin. We kind of got lost and off the path and ended up in this field… for a while.